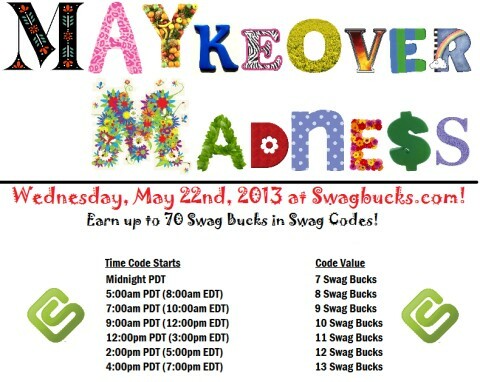 Earn up to 70 Swagbucks during the “MAYkeover Madness” Swag Code Extravaganza. There will be a total of 7 Swag Codes worth 70 Swag Bucks given out starting at midmight (PT) on Wednesday, May 22, 2013. You can see the schedule in the graphic above to find out what times the codes will be released. So what is a Swag Code? It’s another way to get yourself closer to free gift cards on Swagbucks.com, which is a site that rewards you for most of the things you’re already doing online. You can get all sorts of things with the Swag Bucks you earn – I’ve cashed mine in for Amazon and iTunes gift cards, and even used the Lowe’s gift cards I earned from Swagbucks to help pay for a new fridge! New to Swagbucks? Now is a fabulous time to join! Sign up for Swagbucks and when you use the code SKATE70 during registration (click on “I have a sign up code”), you’ll get 70 bonus Swag Bucks on top of the 30 you get just for signing up. That’s 100 Swag Bucks toward your first reward!